Background: The Peninsula Campaign (also known as Peninsular Campaign) during the American Civil War was a major Union operation launched in southeastern Virginia from March through July 1862, and it was the first large-scale offensive in the Eastern Theater. The operation, commanded by Maj. Gen. George B. McClellan, was an amphibious turning movement intended to capture the Confederate capital of Richmond by circumventing the Confederate States Army in Northern Virginia. 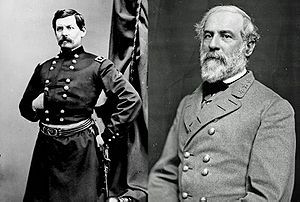 McClellan was initially successful against the equally cautious General Joseph E. Johnston, but the emergence of the aggressive General Robert E. Lee, who assumed command immediately following Seven Pines or Fair Oaks, turned the subsequent Seven Days Battles into a humiliating Union defeat. 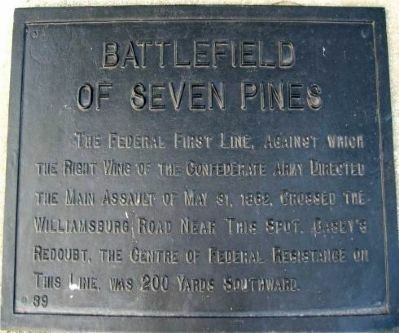 Although the Battle of Seven Pines was tactically inconclusive, it was the largest battle in the Eastern Theater to date (and second only to Shiloh in terms of casualties to date) and marked the end of the Union offensive, leading to the Seven Days Battles and Union retreat in late June. 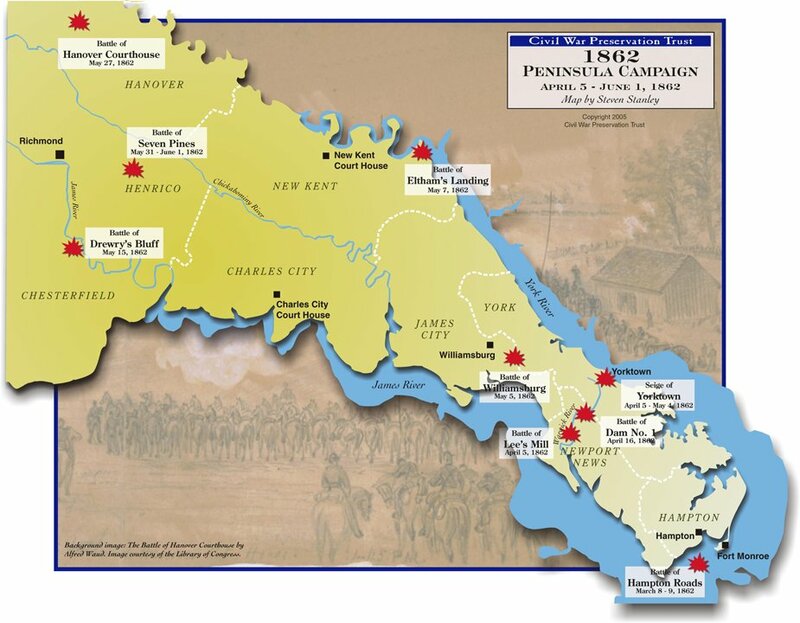 Peninsula Campaign and Seven Days Battles: The Peninsula Campaign [March-July 1862] consisted of the following battles: Hampton Roads, Yorktown, Williamsburg, Eltham's Landing, Drewry's Bluff, Hanover Court House, and Seven Pines. 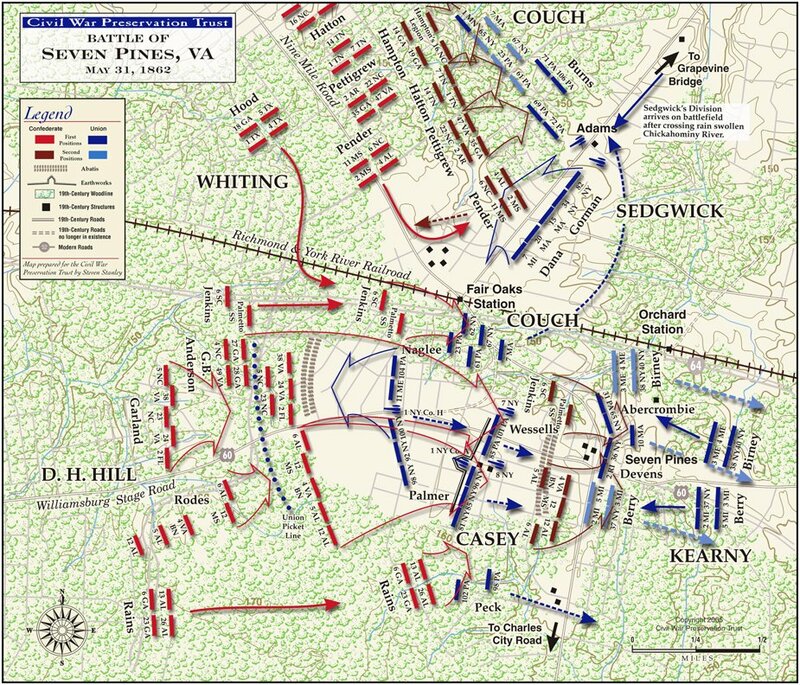 Often studied as a separate campaign, the Seven Days Battles (aka Seven Days Battles Around Richmond), however, were the final battles within the Peninsula Campaign, and included the following battles: Oak Grove, Beaver Dam Creek, Gaines' Mill, Garnetts & Goldings Farm, Savage's Station, White Oak Swamp, Glendale, and Malvern Hill. While McClellan and Joe Johnston opposed each other during the beginning of the Peninsula Campaign, Lee, having replaced Johnston, assumed command during the Seven Days Battles and delivered a severe blow to McClellan and the Union army, and saved Richmond. 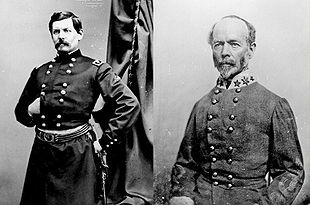 (About) Union Major General George B. McClellan and Confederate General Joseph E. Johnston, commanders of the Union and Confederate armies in the Peninsula Campaign. Description: On May 31, Gen. Joseph E. Johnston attempted to overwhelm two Federal corps that appeared isolated south of the Chickahominy River. The Confederate assaults, though not well coordinated, succeeded in driving back the IV Corps and inflicting heavy casualties. Reinforcements arrived, and both sides fed more and more troops into the action. Supported by the III Corps and Brig. Gen. Sedgwick’s division of Brig. Gen. Sumner’s II Corps (that crossed the rain-swollen river on Grapevine Bridge), the Federal position was finally stabilized. 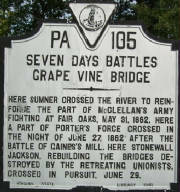 (Right) "Grapevine Bridge and the Seven Days Battles." (Left) Period Map of Union and Confederate army positions at dark on May 31, at the Battle of Seven Pines. Courtesy Confederate War Papers: Fairfax Court House, New Orleans, Seven Pines, Richmond and North Carolina. Sumner, II Corps commander, heard the sounds of battle from his position north of the river. On his own initiative, he dispatched a division under the command of Sedgwick over the sole remaining bridge. The treacherous "Grapevine Bridge" was near collapse on the swollen river, but the weight of the crossing troops helped to hold it steady against the rushing water. After the last man had crossed safely, the bridge collapsed and was swept away. Sedgwick's men provided the key to resisting Brig. Gen. Whiting's attack. At dusk, Gen. Johnston was seriously wounded during the action, and command of the Confederate army devolved temporarily to Maj. Gen. G.W. Smith. 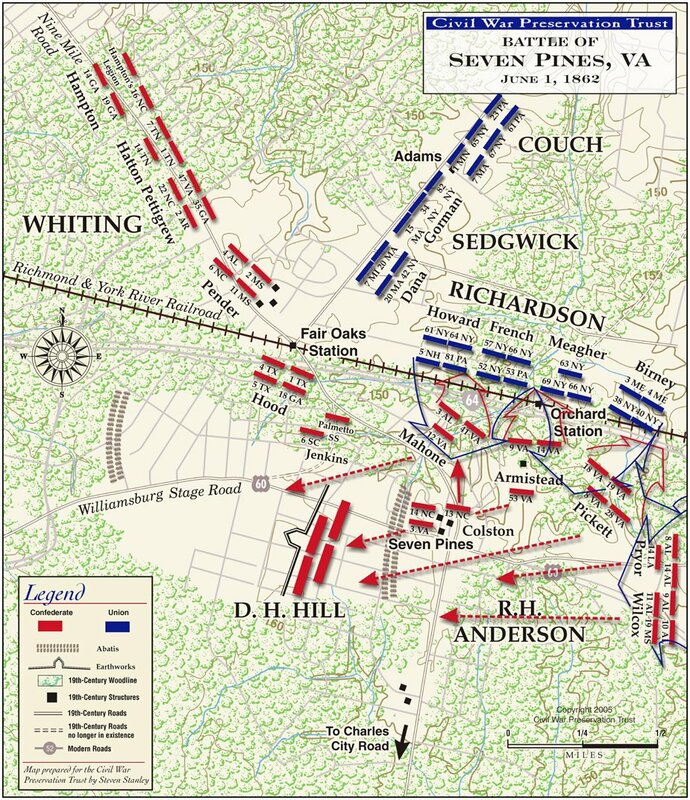 (Left) Map of Union and Confederate troops maneuvering for position at Seven Pines. Smith, plagued with ill health, was indecisive about the next steps for the battle and made a bad impression on Confederate President Jefferson Davis and General Robert E. Lee, Davis's military adviser. After the end of fighting the following day, Davis replaced Smith with Lee as commander of the Army of Northern Virginia. On June 1, the Confederates renewed their assaults against the Federals who had brought up more reinforcements but made little headway. The fighting ended about 11:30 a.m. when the Confederates withdrew, but McClellan and the Union Army did not counterattack. Both sides claimed victory at Seven Pines. Confederate brigadier Robert H. Hatton was also killed. McClellan, "because of his battlefield inaction as well as his failure to follow up his battlefield successes," was eventually relieved of command and he became the unsuccessful Democratic nominee opposing Lincoln in the 1864 presidential election. 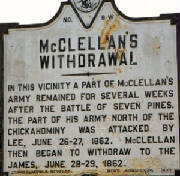 Aftermath: Despite claiming victory at Seven Pines, McClellan was shaken by the experience. He redeployed all of his army except for the V Corps south of the river, and although he continued to plan for a siege and the capture of Richmond, he lost the strategic initiative and never regained it. Lee used the month-long pause in McClellan's advance to fortify the defenses of Richmond and extend them south to the James River at Chaffin's Bluff. On the south side of the James River, defensive lines were built south to a point below Petersburg. The total length of the new defensive line was about 30 miles (50 km). To buy time to complete the new defensive line and prepare for an offensive, Lee repeated the tactic of making a small number of troops seem larger than they really were. McClellan was also unnerved by Jeb Stuart's audacious (but otherwise militarily pointless) cavalry ride completely around the Union army (June 13–15). (Right) Peninsula Campaign, map of events to the Battle of Seven Pines. Excessive caution squandered the opportunity, however, and on 31 May the Confederates struck at McClellan’s divided forces at Fair Oaks. This book details McClellan’s controversial Peninsula campaign and the southern attempt to halt the Union juggernaut. From the Publisher: Highly visual guides to history's greatest conflicts, detailing the command strategies, tactics, and experiences of the opposing forces throughout each campaign, and concluding with a guide to the battlefields today. Analysis: Both sides claimed victory, but neither side's accomplishment was impressive. George B. McClellan's advance on Richmond was halted and the Army of Northern Virginia fell back into the Richmond defensive works. (Right) Vintage Map of Union and Confederate battlefield positions on the morning of June 1, at the Battle of Seven Pines. Courtesy Confederate War Papers: Fairfax Court House, New Orleans, Seven Pines, Richmond and North Carolina. 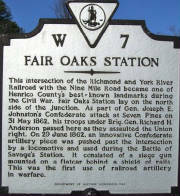 The battle was frequently remembered by the Union soldiers as the Battle of Fair Oaks Station because that is where they did their best fighting, whereas the Confederates, for the same reason, referred to it as Seven Pines. 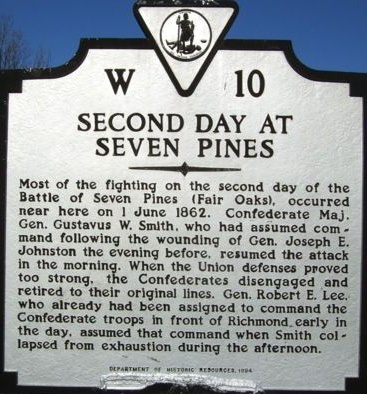 Historian Stephen W. Sears remarked that its current common name, Seven Pines, is the most appropriate because it was at the crossroads of Seven Pines that the heaviest fighting and highest casualties occurred. 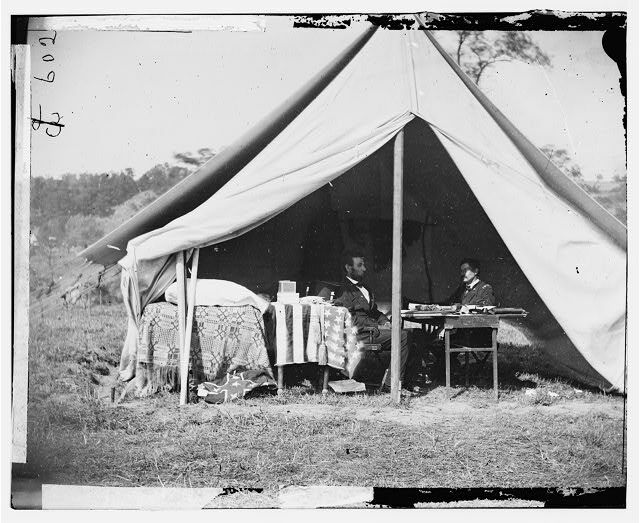 Despite claiming victory, McClellan was shaken by the experience. He wrote to his wife, "I am tired of the sickening sight of the battlefield, with its mangled corpses & poor suffering wounded! Victory has no charms for me when purchased at such cost." He redeployed all of his army except for the V Corps south of the river, and although he continued to plan for a siege and the capture of Richmond, he lost the strategic initiative. 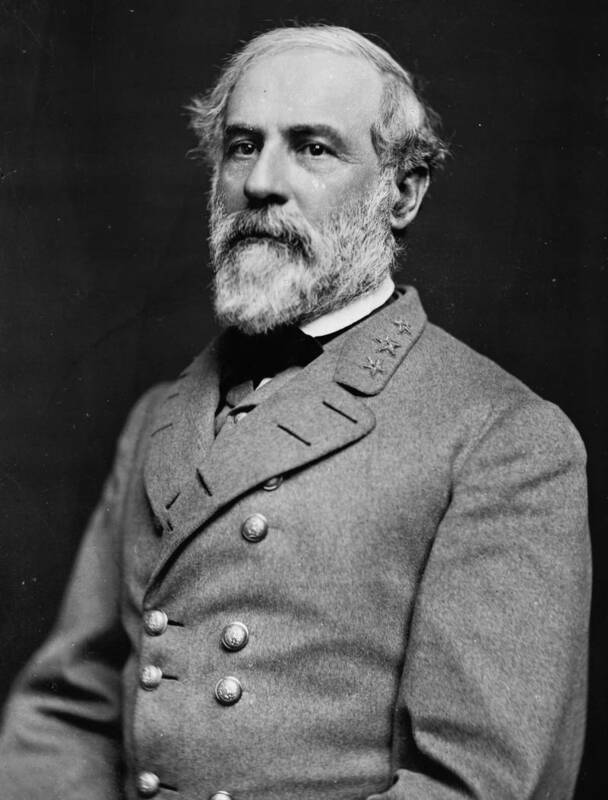 An offensive begun by the new Confederate commander, Gen. Robert E. Lee, would be planned while the Union troops passively sat in the outskirts of Richmond. The Seven Days Battles of June 25 through July 1, 1862, drove the Union Army back to the James River and saved the Confederate capital. 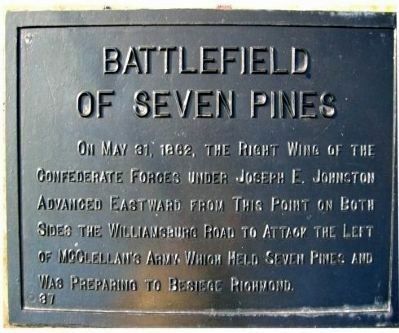 The change in leadership of the Confederate Army in the field, from Joe Johnston to Robert E. Lee, as a result of Seven Pines had a profound effect on the war. On June 24, 1862, McClellan's massive Army of the Potomac was within 6 miles of the Confederate capital of Richmond; Union soldiers wrote that they could hear church bells ringing in the city. Within 90 days, however, McClellan had been driven from the Peninsula, Pope had been soundly beaten at the Second Battle of Bull Run, and battle lines were 20 miles from the Union capital in Washington. It would take almost two more years before the Union Army again got that close to Richmond, and almost three years before it captured it. In the spring of 1862, during the Peninsula Campaign, the Union Army of the Potomac under George McClellan advanced upon Richmond from Fort Monroe, eventually reaching the eastern edges of the Confederate capital along the Chickahominy River. Following the wounding of Gen. Joseph E. Johnston at the Battle of Seven Pines, on June 1, 1862, Lee assumed command of the Army of Northern Virginia, his first opportunity to lead an army in the field. Newspaper editorials of the day objected to his appointment due to concerns that Lee would not be aggressive and would wait for the Union army to come to him. Early in the war his men referred to him as "Granny Lee" because of his allegedly timid style of command. After the Seven Days Battles and until the end of the war, however, his men respectively referred to him as "Marse Robert." He oversaw substantial strengthening of Richmond's defenses during the first three weeks of June and then launched a series of attacks, the Seven Days Battles, against McClellan's forces. Lee's attacks resulted in heavy Confederate casualties and they were marred by clumsy tactical performances by his subordinates, but his aggressive actions thwarted McClellan, who retreated to a point on the James River where Union naval forces were in control. These successes led to a rapid turn-around of public opinion and the newspaper editorials quickly changed their tune on Lee's aggressiveness. Following his defeat at Gettysburg, Lee sent a letter of resignation to Pres. Davis on August 8, 1863, but Davis refused Lee's request. On January 31, 1865, Lee was promoted to general-in-chief of Confederate forces. Fair Oaks, VA, though excused from duty because of disability. until fainting from loss of blood, he was carried off the field. wounded, until he fainted from loss of blood. the call of duty, thus furnishing an example of most distinguished gallantry. effectively to the success of the action. severely wounded in the right arm, necessitating amputation. Captain, Company C, 37th NY Inf; place of birth: Ireland. Gallantly maintained the line of battle until ordered to fall back. which would otherwise have been captured. kept his wounds concealed for another 3 days, until other wounded had left the area. Seven Pines National Cemetery is located in Henrico County, Va., approximately eight miles southeast of Richmond. 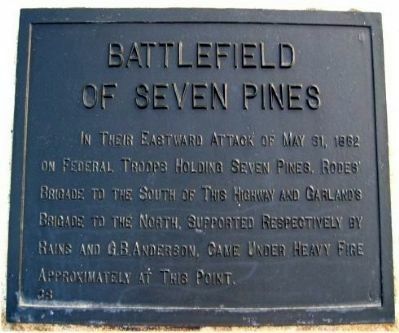 The Battle of Fair Oaks (also known as the Battle of Seven Pines) took place in this region and the cemetery’s 1.9-acres are located on a portion of the Seven Pines Battlefield. (Right) Historical Marker: The Seven Pines National Cemetery was established in 1866 and is located on the "Civil War Seven Pines Battlefield." 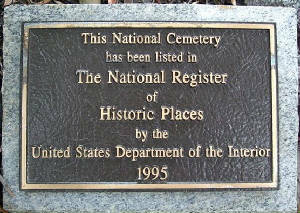 It was added to the National Register of Historic Places in 1995. (Left) Gettysburg Address Historical Marker at Seven Pines National Cemetery. Seven Pines National Cemetery is closed to new interments. The only interments that are being accepted are subsequent interments for veterans or eligible family members in an existing gravesite. Periodically however, burial space may become available due to a canceled reservation or when a disinterment has been completed. When either of these two scenarios occurs, the gravesite is made available to another eligible veteran on a first-come, first-served basis. Since there is no way to know in advance when a gravesite may become available, please contact the cemetery at the time of need to inquire whether space is available. 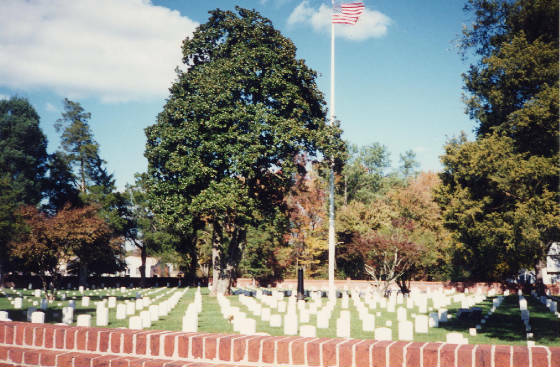 ﻿The area surrounding Seven Pines National Cemetery was the location of the Battle of Seven Pines, also known as the Battle of Fair Oaks. It was the largest engagement of the Civil War in the Eastern Theater up to that point, but the stalemate here led to the Seven Days Battles (six major battles) which took place to the east. Though the Confederates suffered heavy casualties during the battles, Lee's aggressive tactics eventually forced Lincoln to order Union forces to retreat. 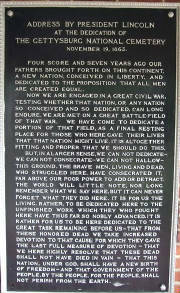 Considering its location, therefore, it seems strange to find a copy of the Gettysburg Address at this cemetery. As recently as 2003, however, the unveiling of a statue in downtown Richmond, which was dedicated to Lincoln, was met with protests. 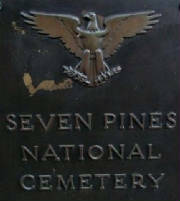 Seven Pines, moreover, is not a Confederate or Union cemetery. It is a resting place for American soldiers who fought in the Civil War as well as other wars. Consequently, Lincoln's message is applicable to all, regardless of location or past circumstances. Sources: Bailey, Ronald H. and the Editors of Time-Life Books, Forward to Richmond: McClellan's Peninsular Campaign, Time-Life Books, 1983; Bailey, Ronald H., and the Editors of Time-Life Books, The Bloodiest Day: The Battle of Antietam, Time-Life Books, 1984; Beagle, Jonathan M., "George Brinton McClellan", Encyclopedia of the American Civil War: A Political, Social, and Military History, Heidler, David S., and Heidler, Jeanne T., eds., W. W. Norton & Company, 2000; Beatie, Russel H., Army of the Potomac: Birth of Command, November 1860 – September 1861, Da Capo Press, 2002; Beatie, Russel H., Army of the Potomac: McClellan's First Campaign, March – May 1862, Savas Beatie, 2007; Blount, Roy, Jr. Robert E. Lee Penguin Putnam, 2003; Burton, Brian K., Extraordinary Circumstances: The Seven Days Battles, Indiana University Press, 2001; Burton, Brian K., The Peninsula & Seven Days: A Battlefield Guide, University of Nebraska Press, 2007; Catton, Bruce. The Army of the Potomac. Volume 1: Mr. Lincoln's Army. Garden City, N.Y.: Doubleday 1951; Carmichael, Peter S., ed. Audacity Personified: The Generalship of Robert E. Lee Louisiana State University Press, 2004; Connelly, Thomas L., "The Image and the General: Robert E. Lee in American Historiography." Civil War History 19 (March 1973); Connelly, Thomas L., The Marble Man. Robert E. Lee and His Image in American Society. New York: Alfred A. Knopf, 1977; Connelly, Thomas L., "Robert E. Lee and the Western Confederacy: A Criticism of Lee's Strategic Ability." Civil War History 15 (June 1969); Cooke, John E., "A Life of General Robert E. Lee" Kessinger Publishing, 2004; Dowdey, Clifford. Lee 1965; Eckenrode, H. J., and Col. Bryan Conrad, George B. McClellan: The Man Who Saved the Union, University of North Carolina Press, 1941; Downs, Alan C., "Fair Oaks / Seven Pines", Encyclopedia of the American Civil War: A Political, Social, and Military History, Heidler, David S., and Heidler, Jeanne T., eds., W. W. Norton & Company, 2000; Editors of Time-Life Books, Lee Takes Command: From Seven Days to Second Bull Run, Time-Life Books, 1984; Eicher, John H., and Eicher, David J., Civil War High Commands, Stanford University Press, 2001; Eicher, David J., The Longest Night: A Military History of the Civil War, Simon & Schuster, 2001; Esposito, Vincent J., West Point Atlas of American Wars, Frederick A. Praeger, 1959; Fellman, Michael (2000), The Making of Robert E. Lee. New York: Random House; Fishwick, Marshall W. Lee after the War 1963; Flood, Charles Bracelen. Lee — The Last Years 1981; Freeman, Douglas Southall. Lee, (4 vol. 1935); abridged one-volume edition, edited by Richard Harwell (1961); the standard biography; Gallagher; Gary W. Lee the Soldier. University of Nebraska Press, 1996; Gallagher, Gary W. Lee & His Army in Confederate History. University of North Carolina Press, 2001; Goodwin, Doris Kearns, Team of Rivals, Simon & Schuster, 2005; Harsh, Joseph L., Confederate Tide Rising: Robert E. Lee and the Making of Southern Strategy, 1861–1862, Kent State University Press, 1998; Kennedy, Frances H., ed., The Civil War Battlefield Guide, 2nd ed., Houghton Mifflin Co., 1998; Martin, David G. The Peninsula Campaign, March–July 1862. Conshohocken, Pa.: Combined Books, 1992; McCaslin, Richard B. Lee in the Shadow of Washington. Louisiana State University Press, 2001; McPherson, James M., Battle Cry of Freedom: The Civil War Era (Oxford History of the United States), Oxford University Press, 1988; McPherson, James M., Crossroads of Freedom: Antietam, The Battle That Changed the Course of the Civil War, Oxford University Press, 2002; Miller, William J., The Battles for Richmond, 1862, U.S. National Park Service and Eastern National, 1996; Nevins, Allan, The War for the Union, Vol. I: The Improvised War 1861 – 1862, Charles Scribner's Sons, 1959; Nolan, Alan T. Lee Considered, University of North Carolina Press, Chapel Hill, NC (1991); Pryor, Elizabeth Brown; Reading the Man: A Portrait of Robert E. Lee Through His Private Letters. New York: Viking, 2007; Rafuse, Ethan S., McClellan's War: The Failure of Moderation in the Struggle for the Union, Indiana University Press, 2005; Reid, Brian Holden. Robert E. Lee: Icon for a Nation, London: Weidenfeld & Nicolson, 2005; Rowland, Thomas J., "George Brinton McClellan", Leaders of the American Civil War: A Biographical and Historiographical Dictionary, Ritter, Charles F., and Wakelyn, Jon L., eds., Greenwood Press, 1998; Rowland, Thomas J., George B. McClellan and Civil War History: In the Shadow of Grant and Sherman, Kent State University Press, 1998; Salmon, John S., The Official Virginia Civil War Battlefield Guide, Stackpole Books, 2001; Sandburg, Carl, Storm Over the Land: A Profile of the Civil War, Harcourt Brace and Company, 1942; Sears, Stephen W., Controversies and Commanders: Dispatches from the Army of the Potomac, Houghton Mifflin Company, 1999; Sears, Stephen W., George B. McClellan: The Young Napoleon, Da Capo Press, 1988; Sears, Stephen W., Landscape Turned Red: The Battle of Antietam, Houghton Mifflin, 1983; Sears, Stephen W., To the Gates of Richmond: The Peninsula Campaign, Ticknor and Fields, 1992; Smith, Eugene O. Lee and Grant: a Dual Biography, McGraw-Hill, New York (1991); Thomas, Emory Robert E. Lee W.W. Norton & Co., 1995; Webb, Alexander S., The Peninsula: McClellan's Campaign of 1862, Castle Books (reprint 2002), 1881; US History Encyclopedia; Webb, Alexander S., The Peninsula: McClellan's Campaign of 1862, Castle Books (reprint 2002), 1881; National Park Service; National Archives; Library of Congress; PBS; Civil War Preservation Trust; Richmond National Battlefield Park Historical Handbook; Official Records of the Union and Confederate Armies; Seven Pines National Cemetery.